Location, Location, Location~Less than 1 Mile to Manasota Beach and its NEWLY RENOVATED Public Boat Dock! This One-Owner, Lovingly-Maintained Custom Built home is designed with COASTAL living in mind. Where can you find a 2200+ SF Home with a 4 Car Garage (2 car attached, oversized 2 car detached) and off-street RV Parking and Hookup this close to the beach! Enter the Double Entry Glass Doors & you're instantly in AWE of the soaring volume ceilings, water view, and entertaining space! The 14' ceilings and 12' arched window allows plenty of natural light. Formal Dining and Living Rooms flow seamlessly and feature a Wood-Burning Fireplace with authentic CORAL stonework and double French doors leading to a fully tiled Lanai. The Kitchen, Dinette, and Casual Family Room/Game Room offer easy access to your Lanai, fenced in yard and Pool Bath. The Guest Bedrooms are offset with a hall and share a guest bathroom with tile floors and tub/shower. Master Suite is a generous 21'x14' with his-her walk-in closets, dual sinks, heat light, Jacuzzi tub & Roman shower. The backyard is completely FENCED in and overlooks the pond so you can enjoy birding, fishing, wildlife peaceful sunrises & sunsets! 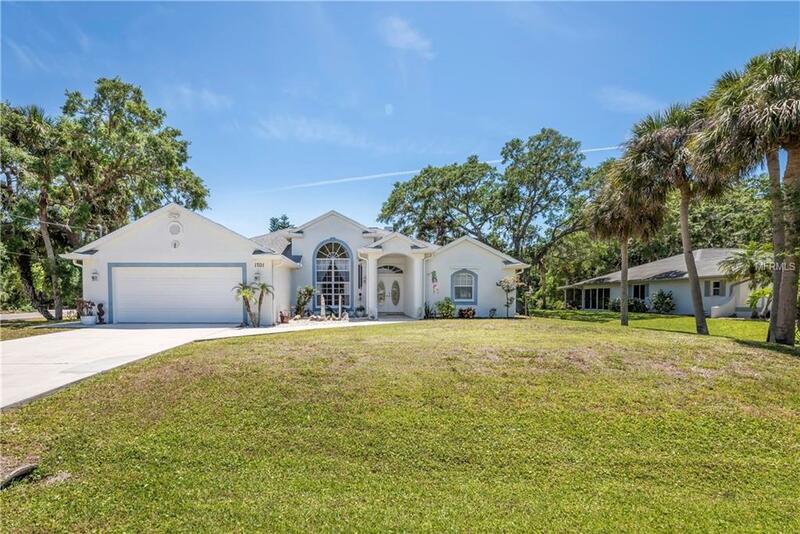 You'' love the oversized, detached garage complete with a huge workbench, storage cabinets and an XL DRIVEWAY to pull in your boat, RV, golf cart or jet skis. This home is a GEM~only minutes to Gulf Beaches, World-class Fishing, Boating, Golfing, Shopping, Dining and much more.